This year SIROCCO will be held in Helsinki, Finland. The conference venue is the main building of Aalto University School of Business, situated near Helsinki city centre. The address is Runeberginkatu 14–16, Helsinki. See below for a map. Conference talks take place on the 3rd floor, in hall A-301. You will also find the registration desk near the lecture hall. Coffee will be served in the same building, on the 2nd floor, in front of Nokia hall. Lunch will be served at Restaurant Helka, which is a 5-minute walk from the conference site. 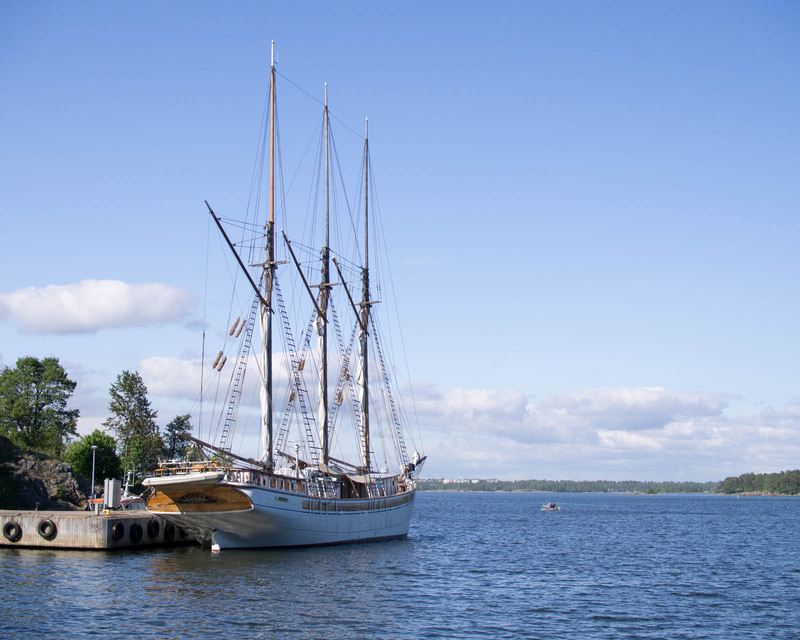 On Wednesday, we will have a cruise on Schooner Linden, departing and arriving on Halkolaituri, and after that we will have conference dinner at Katajanokan Kasino, which is a short walk from Halkolaituri. Before the cruice, we will have a walking tour from the conference site, through Helsinki city centre, to Halkolaituri. The distance is approx. 2.5 km, it will take approx. 40 minutes, and we will see many of the key attractions of the city centre along the way — see below for a map. If you would prefer to avoid a long walk, you can also e.g. take tram number 2 to Market Square and walk from there to Halkolaituri, or try Helsinki city bikes. After dinner, you can walk back to the Market Square and then e.g. take tram 2 or simply walk back to your hotel if it is not far from the city centre. “aalto open”: free and open for everyone, no login needed. “eduroam”: if you use Eduroam at your home university, it will work precisely the same way here as well. In the lecture hall, there is a Windows computer that you can use to give your presentation. Both PowerPoint and Adobe Acrobat are installed in the computer. Alternatively, you can connect your own laptop to the projector. There are both HDMI and VGA connectors available, and it works fine with Mac laptops with the usual adapters. Slides with a 16:9 aspect ratio are preferred, but 4:3 will work, too. Click on the map to see it in a larger scale. 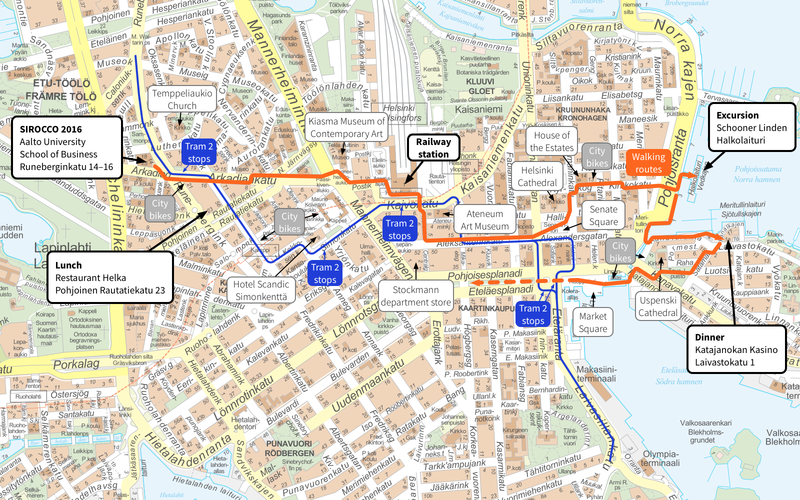 Source: Guide Map of the City of Helsinki. The administrator of this data is Helsingin kaupungin kiinteistövirasto and the original creator is Helsingin kaupunki, kiinteistöviraston kaupunkimittausosasto. The data has been downloaded from the Helsinki Region Infoshare service 09.07.2016 using the license Creative Commons Attribution 4.0 International (CC BY 4.0). There are lots of direct flights to Helsinki Airport, especially from Europe and Asia. Here are some examples of destinations and flight times: Beijing 7:50h, Tokyo 9:45h, New York 8:40h, Chicago 9:15h, London 3:10h, and Frankfurt 2:40h. There is a direct train connection from Helsinki Airport to Helsinki central railway station. The trip takes 30–35 minutes and costs 5.50 euros (see below for more details). You can also arrive to Helsinki by train from St. Petersburg (3.5h), or take a ferry from Tallinn (a couple of hours) or Stockholm (overnight). The conference venue is just a 15-minute walk from the central railway station. There is also a tram line (tram number 2) that conveniently connects the conference venue, Kamppi shopping centre, Kamppi metro station, the central railway station, Senate Square, Market Square, and many of the main tourist attractions in downtown area. Some of the most relevant tram stops are also marked in the map above. You can also try Helsinki city bikes — it is best to register in advance to get the access code. Here is a video that shows how to use city bike system (in Finnish, but with English subtitles). Check the HSL Journey Planner for public transportation options in Helsinki. All local trains, metro, trams, buses, and the ferry to Suomenlinna use the same ticket system — see HSL web pages for information on the ticket prices. Note that Helsinki Airport is located in Vantaa, so you will need a regional ticket (5.50 euros) for the airport train connection, while for most other trips a Helsinki internal ticket is fine (3.20 euros). From airport to city centre: Follow the signs for the airport railway station. Locate a ticket vending machine and buy a single ticket to Helsinki for 5.50 euros; the usual credit cards should be fine fine. Then board the next train that arrives at the platform — any I train or P train that goes in any direction is fine. There are no seat reservations, you can take any seat in any car. The trip will take 30–35 minutes, and the final stop is at the central railway station. You can use the same ticket to e.g. continue your trip with a tram or a bus if needed. From airport to city centre at night: Follow the signs for buses. Locate the platform of bus 615. The driver will sell you a ticket to Helsinki for 5.50 euros, in cash. If you do not have cash, there is also a ticket vending machine at the bus stop that you can use with your credit card. From city centre to airport: Locate an HSL ticket vending machine at the central railway station and buy a single regional ticket for 5.50 euros. Board the next I train or P train. Leave at the airport railway station. Occasional tram or bus trips in Helsinki: Just buy a single internal ticket from the driver (3.20 euros, valid for a single trip inside Helsinki). Credit cards are not accepted; you will need cash, and do not expect that the driver will have change for large banknotes. Travelling a lot in Helsinki: Locate an HSL ticket vending machine and buy a multi-day internal ticket (e.g. 20.00 euros for 4 days). You will get a paper ticket that is valid from the moment of purchase. If you have a multi-day ticket with you, you can simply board a tram without doing anything. In buses, show the ticket to the driver. In trains, there is ticket sales in only certain cars. If you do not have a ticket when you are boarding a train, see the signs outside the train to locate a ticket sales car. Here are some suggestions of places to stay in Helsinki — these are also shown in our map, together with many other hotels. We have got some room blocks reserved with a fixed room rate, but as usual, it is also a good idea to check the current room rates directly via the hotel web sites and the usual hotel reservation sites such as Booking.com and Hotels.com. We have reserved room blocks for Monday–Thursday 18–21 July 2016 in the following hotels and hostels. The conference rate is 125 EUR / night / 1-person room, including a buffet breakfast, sauna, and wifi. For reservations, contact the hotel directly, no later than on 16 June 2016, and mention the reservation code “SIROCCO 2016”. The conference rate is 124 EUR / night / 1-person room and 144 EUR / night / 2-person room, including breakfast and wifi. For reservations, contact the hotel directly, no later than on 4 July 2016, and mention the reservation code “AAL180716”. The conference rate is 49 EUR / night / 1-person room and 62 EUR / night / 2-person room, including bedclothes, a towel, and sauna in the morning. Breakfast costs 7.5 EUR / person. For reservations, contact the hostel directly, no later than on 16 June 2016, and mention the reservation code “SIROCCO 2016”. There is no wifi, but the rooms have wired Internet access; an Internet cable can be borrowed from the reception for 3 euros per stay. The rooms have a WC, shower, small kitchen and a refrigerator. Further information on the rooms. Border control: Finland is part of Schengen Area. Electricity: 230V. Power sockets are similar to those used in Germany. The flat Europlug always fits. Money: We use euros. Look for a yellow “Otto” sign to locate an ATM. For currency exchange, Forex at the central railway station is a good option. Credit cards are very widely accepted in shops and restaurants; Visa and MasterCard are the most commonly recognised brands. Pharmacy: “Apteekki” in Finnish. Yliopiston Apteekki (Mannerheimintie 5) is open from 7am to midnight. Shopping: Large department stores are typically open Mon–Fri 9am–9pm, Sat 9am–6pm, and Sun 12am–6pm; small grocery stores have more flexible opening hours. S-market Sokos Helsinki next to the central railway station is open 24/7. Tap water: Perfectly safe to drink; there is no need to buy bottled water. Tipping: Never expected in restaurants or elsewhere. Tourist information: See the Visit Helsinki web site for more information on what to do and what to see in Helsinki. For a guidebook, try the Helsinki chapter of LonelyPlanet Finland travel guide. Weather: Average maximum temperature in July is 21–22 °C. See the FMI weather forecast for the current weather.